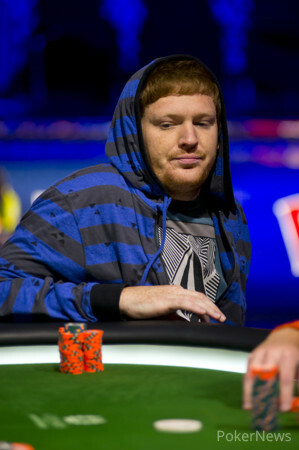 Chris Dombrowski opened with a button raise and Jesse McEuen made the call to see a flop fall. McEuen led for 40,000 and Dombrowski made the call as the landed on the turn. Both players checked as the river landed the and McEuen bet out 40,000. Dombrowski made the call, but then mucked at the sight of McEuen's for a six-high straight. Mathew Moore bumped it up to 85,000 on the button and Chris Dombrowski defended his big blind to see a flop fall. Dombrowski checked and Moore tossed in 95,000 which resulted in a call by Dombrowski as the landed on the turn and Dombrowski again tapped the table. Moore splashed out 190,000 and after careful consideration, Dombrowski folded his hand. Mathew Moore raised from the button to 85,000 and Chris Dombrowski reraised to 240,000. Moore folded and Dombrowski took the pot. Dombrowski completed the small blind and Moore checked his option. Dombrowski led for 50,000 on the flop and Moore folded. Moore raised to 105,000 from the small blind and Jesse McEuen made the call. Moore continued for 110,000 on the flop and McEuen called. Both players checked the turn. The river saw both players checking and McEuen won the pot with . Moore raised to 85,000 from the button and Dombrowski called from the big. Dombrowski check called Moore's bet of 90,000 on the flop. Both players check the turn. Dombrowski led for 215,000 on the river and Moore folded. Dombrowski completed the small blind and Moore checked his option. Dombrowski led for 40,000 flop and Moore called. Dombrowski bet 115,000 on the turn and Moore made the call. Dombrowski bet 320,000 on the river and Moore made a tough call with . Dombrowski tabled and Moore won the pot with a pair of queens. 100 hands into the final table and six eliminations have occurred! Chris Dombrowski kicked it off with a button raise of 85,000 only to have Jesse McEuen three-bet to 250,000 from the large blind. Pausing only for a few moments, Dombrowski eventually tossed his cards into the muck. From the button Mathew Moore raised to 85,000. Jesse McEuen bumped it up to 270,000 from the small blind before Moore made the call to see a flop spread by the dealer. McEuen and Moore both checked as the graced us with it's presence on the turn. McEuen fired out a delayed continuation-bet of just 40,000 as Moore made the call before the completed the community cards. Sliding in a stack, McEuen's bet of 180,000 was met with a Moore fold to see McEuen win the pot to soar closer to chip leader Chris Dombrowski. From the button Jesse McEuen bumped it up to 85,000 and Mathew Moore defended the large blind to see a flop fall. Both players checked as the on the turn saw Moore lead for 90,000. McEuen tossed his cards in the direction of the muck and Moore took some back. 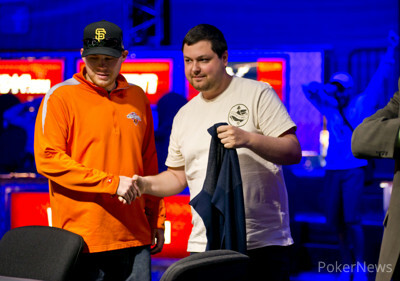 Chris Dombrowski raised his button to 85,000 only to have Mathew Moore make it 240,000 from the small blind. With the action back on Dombrowski, he four-bet to 445,000 to put the pressure back on local player Moore. Moore shuffled his chips for a few moments before moving all in to produce a swift fold from Dombrowski. Chris Dombrowski raised from the button McEuen made the call form the big. Both players check the flop and the turn. McEuen bet 125,000 on the river and Dombrowski released his hand. Mathew Moore raised to 90,000 from the button and McEuen reraised to 250,000. Moore folded and McEuen won the pot. Dombrowski raised to 100,000 from the small blind and Moore folded from the big. Dombrowski raised to 85,000 from the button and the blinds folded. Moore raised to 85,000 from the button and McEuen made the call, as does Dombrowski. McEuen checked dark on the flop and Dombrowski and Moore also checked. McEuen checked the river and Dombrowski bet 140,000. Both Moore and McEuen folded. Dombrowski completed the small blind and Moore took his option and raised to 105,000. Dombrowski made the call and they saw a flop of which both players checked. Dombrowski checked the turn and Moore bet 135,000. Dombrowski folded and Moore raked his first pot since break. 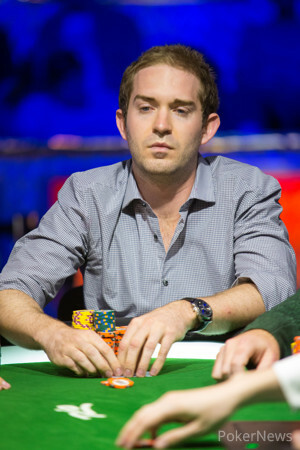 Jesse McEuen opened to 90,000 from the button only to have Dimitar Yosifov move all in. McEuen instantly made the call and the cards were tabled. With Yosifov trailing, the changed little, but it would be the on the turn that would thrust him into the lead. As the rail let out some groans after the three-outer Yosifov had just hit, the dealer would deliver the on the river to send the overnight and final table chip leader crashing to the rail in 4th place for a $107,922 payday. Mathew Moore bumped it up to 90,000 from the small blind and Jesse McEuen made the call as the dealer dropped a flop. Moore went to bet and McEuen kicked his cards to the muck. From the button Mathew Moore made it 85,000 and he collected the blinds and antes. Carter Myers moved all in from the cutoff for 595,000 and Chris Dombrowski made the call and was ahead going to the flop. Myers needed help but couldn't find it when the board came . Myers hits the rail in 5th place taking home $78,876 for his efforts. Jesse McEuen raised to 90,000 from the small blind and Carter Myers folded the big. McEuen raised to 90,000 from the button and Dombrowski made the call. 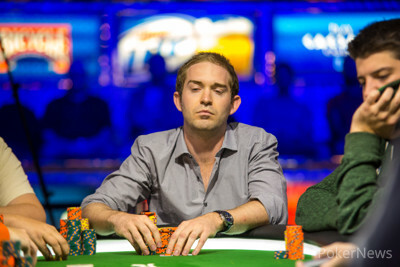 Dombrowski check folded the flop to McEuen's bet of 95,000. Dombrowski moved all in from the small and Dimitar Yosifov folded from the big. Dimitar Yosifov raised to 60,000 on the button and the blinds folded. Jesse McEuen moved all in from the small blind and Carter Myers folded from the big. Chris Dombrowski received a walk in the big blind. Dombrowski raised to 70,000 from the small blind and Yosifov folded from the big. McEuen raised to 75,000 from under the gun and it folded around. Moore raised to 75,000 from the small and McEuen moved all in from the big blind for 945,000. Moore folded and McEuen is stacking some chips as the players head out for a 20-minute break. The action folded round and Chris Dombrowski received a walk in the big blind. From the button Carter Myers moved all in and picked up the blinds and antes. It was Mathew Moore's turn to receive a walk in the blind. Carter Myers moved all in once again and collected the blinds and antes. Chris Dombrowski opened to 65,000 and picked up the blinds and antes. Mathew Moore bumped it up to 60,000 from the cutoff only to have Carter Myers move all in from the small blind. Moore folded and Myers scooped yet another pot. Jesse McEuen opened to 65,000 from the cutoff and won the blinds and antes. Dimitar Yosifov raised to 60,000 and Jesse McEuen reraised to 200,000. Yosifov folded and McEuen won the pot. McEuen raised to 75,000 and Carter Myers moved all in for 395,000 prompting a fold from McEuen. Yosifov moved all in from the small blind for 730,000 and Mathew Moore released his hand from the big. Chris Dombrowski raised to 65,000 and McEuen called. Both players checked the flop. McEuen checked the turn and Dombrowski bet 90,000. McEuen folded and Dombrowski won the pot. McEuen completed from the small blind and Myers used his option to move all in. McEuen folded and Myers took the pot. Mathew Moore opened to 60,000 and Chris Dombrowski defended his big blind to see a flop fall. Moore's bet of 65,000 was enough to prompt a fold from Dombrowski. Carter Myers raised the button to 60,000 and picked up the blinds and antes. From the button Chris Dombrowski made a raise to 65,000 and won the blinds and antes. Dimitar Yosifov moved all in from the button and the blinds passed. Chris Dombrowski raised to 65,000 only to have Dimitar Yosifov move all in for 365,000. Carter Myers followed suit and pushed for roughly 700,000 to force Dombrowski out. The board ran out to ensure Yosifov the double. Carter Myers raised to 60,000 and it folded around. Myers raised to 60,000 from under the gun and Chris Dombrowski made the call from the cutoff. Myers bet 50,000 on a flop and Dombrowski called. Myers checked the turn and Dombrowski bet 140,000. Myers folded and Dombrowski took the pot. Yosifov raised to 60,000 and Mathew Moore reraised to 135,00. Yosifov 4-bet to 215,000 and Moore answered with a 5-bet to 350,000. Yosifov moved all in and Moore called. The board came and neither player improved giving Moore the double up.